Anyone out there finding themselves in blogging doldrums? It is that time of the year for feeling a little blah. We are sick of winter (except for maybe Michaela) and spring seems so far away. If you look over there at my calendar of this month’s posts, there are not a lot. I have discovered there is plenty of blogging inspiration out there, however, if you have a little look around. Did you know that Gerry has a second blog dedicated to inspiring folks to be creative? She calls it her “Gently Used Ideas Store.” Go have a look if you haven’t already. Then one day I noticed right here on WordPress, in one of those little announcements they give you while you are poking around your dashboard, that WordPress itself is working hard to inspire bloggers too! They have their own blog called The Daily Post at WordPress with a new subject to blog about each day. They invite you to become part of “Post a Day 2011” or “Post a Week 2011” to help keep your blogging mojo going. Within the Daily Post, there is also a Weekly Photo Challenge. I haven’t explored this too much yet, but I think I’ll have a closer look as soon as I finish finding photos for the scavenger hunt. I’ll be anxiously awaiting seeing the results of all you creative souls. To keep my creative juices flowing, I have recently signed up for Picture Inspiration. This is from the same folks who brought us Picture Winter and Picture Fall, but the format is a bit different. Rather than one photo prompt a day for a month, this will be weekly emails for a year. Emails are described as containing a mix of prompts, challenges and projects. It is scheduled to begin on February 22; I’m looking forward to seeing the new ideas. So with all these ideas to choose from, none of us should be able to claim writers’ or photographers’ block any time soon, right? Happy blogging! Your photo today is so pretty! A nice reminder for all those still buried in snow, that spring will be here soon. Thank you – those are Valentine clearance flowers that I bought for myself! Your new class sounds like fun. I like the idea of a mix of prompts, challenges and projects, and I look forward to seeing where that takes you. You are incredibly creative with that sort of thing (whereas I tend to overly literal, something I’m trying to work on). I’ve only managed to find 4 of the things on the scavenger hunt list. I better get moving on that. Thank you! Yes, the new class sounds just right. Once a week is perfect. I’m trying to get moving on the list too! And remember that snow that you said was probably headed our way and I said, nah I don’t think there’s any snow in our forecast? Well, dang it, it is here! You’re a mom and you keep dogs. You have enough shoulds in your life. Thou shalt not should thyself. I think you’ll make yourself crazy if you go haring off after everybody else’s whims–even mine. What do you love to tell stories about? What makes you laugh, or absorbs you so deeply that you really want to dig into it? Blogging is not a discipline, it’s a medium of communication. The really cool thing about it is that you can do what you want when you want if you want. No obligation. Your new class does sound like fun, and it sounds like the kind of fun you like to have! Enjoy it. And, um, thanks for the flowers. Dressed the place up a treat they did. Oh I agree, Gerry! I did this post more like a “public service announcement” for people who might be in need of ideas from time to time. I might have a peek at these sites from time to time when I might feel like blogging but I am not sure what I feel like writing about. The name of this blog is “When I Feel Like It” afterall! And the once-a-week pace of the new class I think will be perfect for me. Glad you liked the flowers! They were on-sale Valentine’s clearance flowers that I bought myself! I am currently doing MCP Project 52 and so far haven’t had to purposefully take a photo for her theme since I take so many each week I can always find one that fits right in. I’ll also be joining you for Picture Inspiration. I like the format of once a week instead of daily, less pressure and more time for thought. Lovely daisies! That’s interesting to know about MCP. With all this snow and work and blah blah blah, I feel like I haven’t picked up my camera as much as I’d like to, so I’m really looking forward to Picture Inspiration. And like you said, the once a week sounds just right. 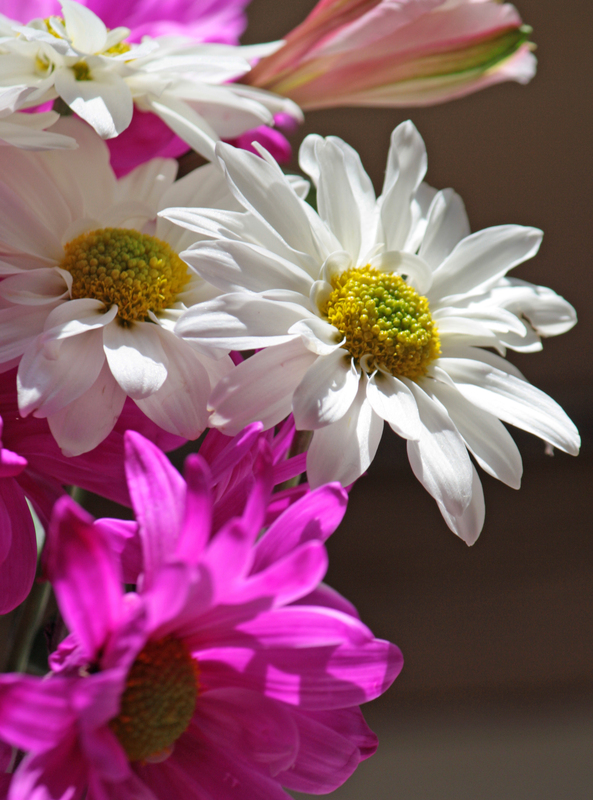 Thank you – daisies are cheerful little things, aren’t they? Your flower photo is beautiful, a day brightener for me as is once again snowing here. 🙂 Winter can get a bit long sometimes… I often wonder if spring would seem so delightful if winter was any shorter… Looking forward to your new photo projects, no matter how often inspiration strikes! It was snowing again here too – enough is enough already, huh? Luckily it was only a couple inches, so not much to worry about. This winter has been BRUTAL! Nice to hear that others are seeking inspiration just like me as it is very easy to let the winter doldrums get us down. Thanks for the reminder about the scavenget hunt! I hope our bitter temps subside so that I can get out and shoot some of the things! Looking forward to seeing your take on things, Tracy. I’m currently contemplating how to take a picture of a big truck that would be somewhat interesting!